Product prices and availability are accurate as of 2019-04-05 16:41:42 EDT and are subject to change. Any price and availability information displayed on http://www.amazon.com/ at the time of purchase will apply to the purchase of this product. Please check the ISBN that your instructor provided. If the ISBN-13 does not match this product (9781305254633) or its Printed Access Card equivalent (9781305254640) this may not be the correct product. In some cases, you may also require a course code from your Instructor. Succeed in your accounting course with CengageNOW, a powerful online homework tool that optimizes your learning experience. This interactive system generates a diagnostic Personalized Study Plan (with a chapter-specific Pre-test, Study Plan, and Post-test) to help you master concepts, prepare for exams, and get a better grade. This product requires a Course Key from your Instructor to fully activate. Please consult your Professor or class syllabus for the specific Course Key. 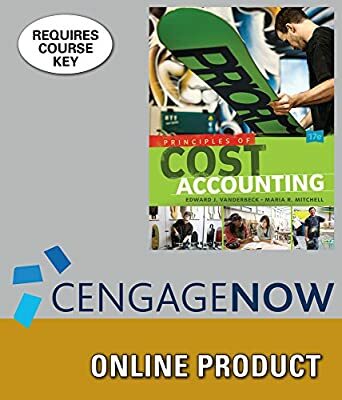 ISBN: 9781305254633 This access code entitles you to 1 course enrollment. The duration of the code is course length + 14 days. After this period, this product can be viewed under the "view expired" link in your CengageBrain account.